Did you know that December 4th was National Cookie Day?? Yeah, I didn't either. But I think my subconscious did! 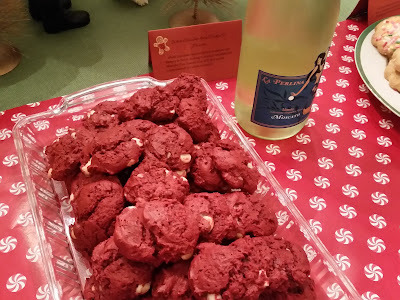 I unknowingly planned a cookie and wine pairing party for last Friday evening which just happened to be National Cookie Day. I hosted the pairing party for the new members of the Junior League as a social. I spent quite a bit of time researching what pairings to feature at the party. It wasn't the easiest thing to find information on. If, however, you'd like to have specifically a Girl Scout cookie and wine pairing then there is a plethora of information for that! 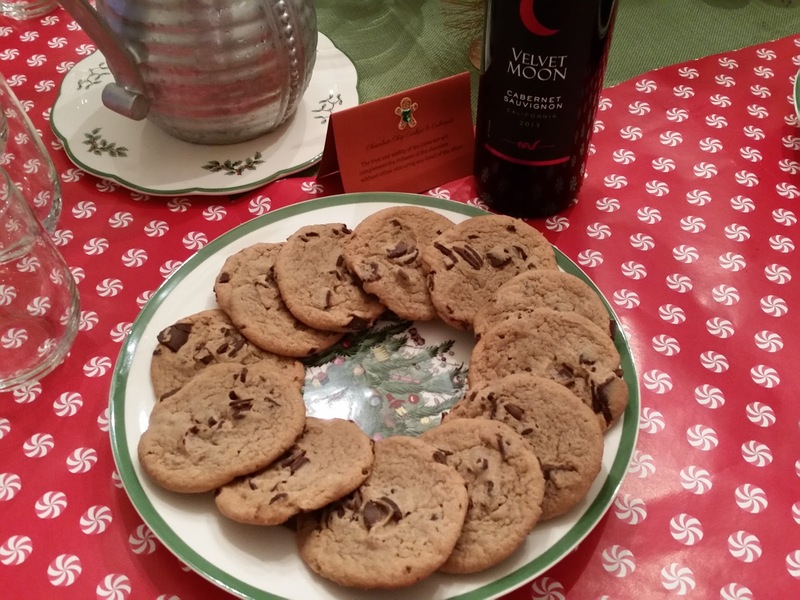 This "Baking Bites" website gives a good rundown on pairing wines and dessert. The majority of my information and pairings came from this "Swirl Savvy" blog post and then a bit of additional information from this "Vine Pair" graphic. I landed on 7 pairings: Sugar Cookies & Prosecco, White chocolate-based Cookies & Moscato, Gingerbread Cookies & Riesling, Snowball Cookies & Pinot Grigio, Chocolate peppermint Cookies & Cabernet, Dark chocolate-based Cookies & Red Zinfandel, and finally Chocolate chip Cookies & Cabernet. 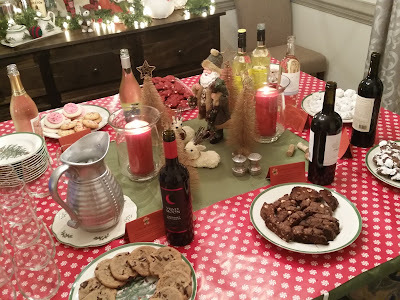 Before the party I sent out a sign up to everyone coming and had the ladies choose which cookie or wine they wanted to bring. This worked out perfectly! 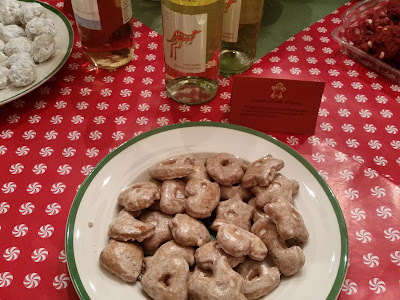 The pairings were all placed around the dining room table and the tasting happened at everyone's leisure. 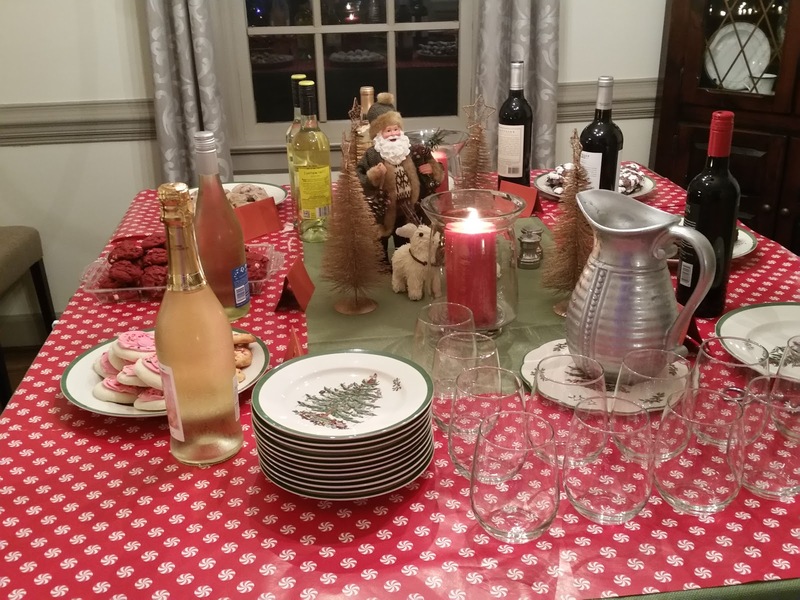 I was really proud of myself for using our Christmas dishes (the salad plate) and stemless wine glasses - no paper products! I had paper napkins but I actually forgot to put them out so this was really a zero waste party! Well, I guess technically I need to retract that statement. I cut out wrapping paper to place as a border around the table. Since there would be lots of small amounts of wine being poured I didn't want anyone to have to worry about dripping on the tablecloth so this was a good (and festive) way to protect against wine drips. The wrapping paper was later recycled though! Now here are the tasting notes for the different pairings and I'm sharing the recipes for the cookies if they were homemade. The pairings are presented from light intensity to strong. 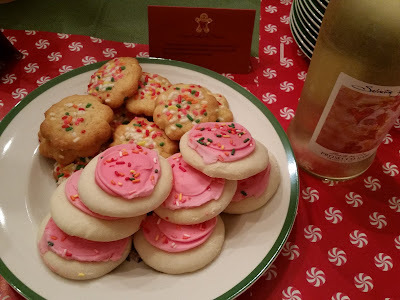 The sugar cookies and prosecco are light on the palette and therefore were our first pairing while we end with the richness of chocolate chip cookies and cabernet. The tasting notes were printed onto the red card tents with a gingerbread man sticker on it! The quintessential Christmas cookie, Prosecco’s hint of sweetness and bubbles go perfectly with the delicate flavors of the cookie. The bubbles in this sparkling wine go wonderfully with the crunchy sugar coating on the cookies as well. White chocolate tends to be more mellow and buttery in flavor, making it an ideal candidate for Moscato. This dessert wine will pick up the creaminess of the white chocolate. Moscato fabulously accompanies any fruit-filled cookie as well. In a mixing bowl, combine the cake mix and butter, Add the egg, vanilla, and cream cheese and beat until mixed thoroughly. Stir in the chips by hand. Chill the dough at least 30 minutes. Roll the dough into 1 -1 1/2 inch balls. Bake on a nonstick surface at 350F for 9 minutes. Let rest on pan for 2 minutes before removing to parchment lined counters. Cool completely before storing in a sealed container for up to 5 days. Makes 36 cookies. The slightly sweet flavors of the Riesling make it an ideal pair for the spicy flavors of ginger. The wine will be a perfect match, showing delicious honey, vanilla & fruit flavors and is sure to be a holiday hit. 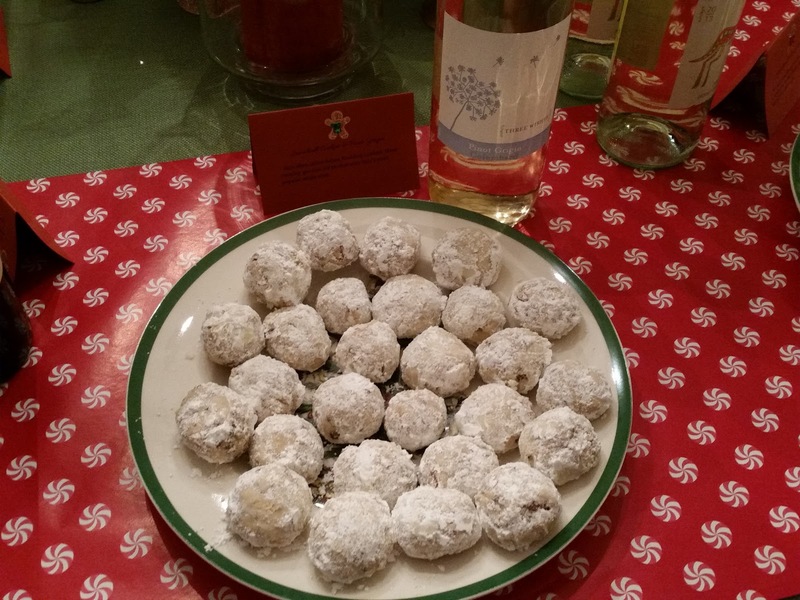 Also often called Italian Wedding Cookies, these crumbly goodies are perfect with Italy’s most popular white wine. Mix butter and flour, then salt, rum, water, nuts, and chocolate chips. Form into small balls. Bake at 325 for 15-20 minutes. Roll two times in confectioners sugar. A holiday favorite! Cabernets are a great match for any variation of mint and chocolate because they have pronounced minty nuances of their own. They offer a cornucopia of rich raspberry, blackberry and cherry, with hints of clove and mint that explode on the palate. Microwave first 3 ingredients in a medium-size microwave-safe bowl at HIGH 1 to 2 minutes or until butter and chocolate are melted and smooth, stirring every 30 seconds. Stir in granulated sugar and next 2 ingredients until blended. Stir together flour, cocoa, and baking powder in a small bowl. Stir flour mixture into chocolate mixture until well blended. Cover bowl with plastic wrap, and chill 1 hour to 5 days. Preheat oven to 350°. Carefully drop dough by level spoonfuls into powdered sugar, using a 1 1/2-inch cookie scoop, and roll to coat. Place coated cookies 1 inch apart on 2 parchment paper-lined baking sheets. Bake, in batches, at 350° for 10 minutes or until cookies are crackled. Cool completely on a wire rack (about 20 minutes). Dark or bittersweet chocolate needs a stronger wine with concentrated fruit notes, and perhaps a hint of its own chocolate notes. Zinfandels have a history of perfecting the dark chocolate match, resulting in an unparalleled tasting combination. In a large bowl, beat together the 3 eggs, sugar, and vanilla & almond extracts. Gradually stir in the dry ingredients, then mix in the nuts and the chocolate chips until the dough holds together. America’s favorite red with America’s favorite cookie. 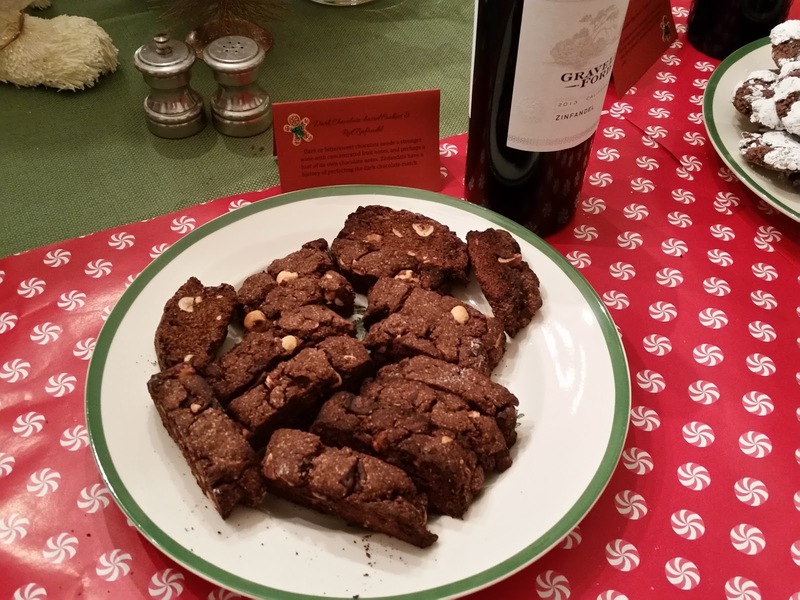 Chocolate goes great with Cabernet, especially if the chips are of the dark variety. The fruit and acidity of the Cabernet will compliment the richness of the chocolate without either obscuring any detail of the other. 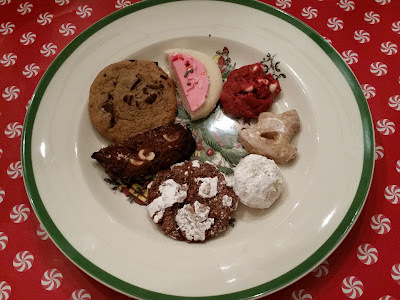 -Set a knife next to each plate so that the cookies can be cut into smaller portions! This is a lot of sweet stuff! Also make sure to have a water pitcher on the table. -The Gingerbread & Riesling as well as the Chocolate peppermint & Cabernet were our favorites. -Have some goody bags on hand to divide the leftover cookies with folks. 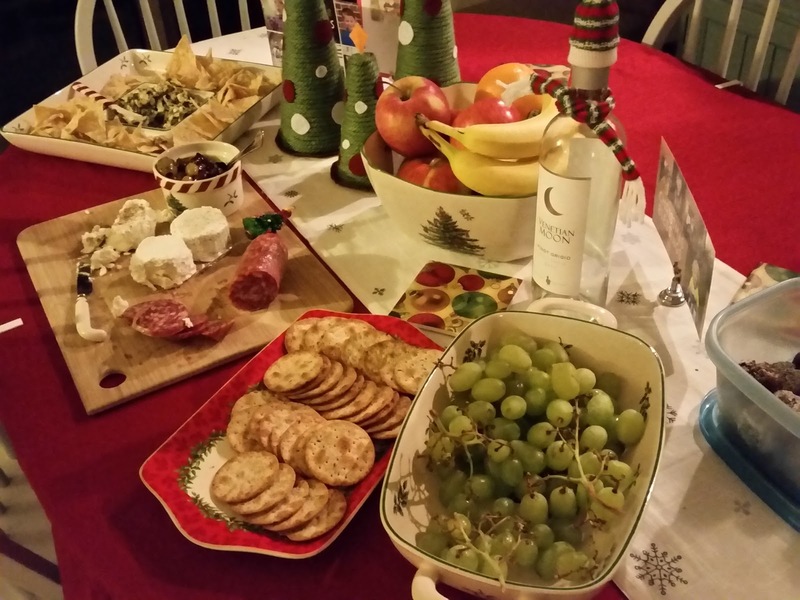 -Make sure to have a small savory spread as well so if someone wants something heavier after all the cookies and wine they'll have it. 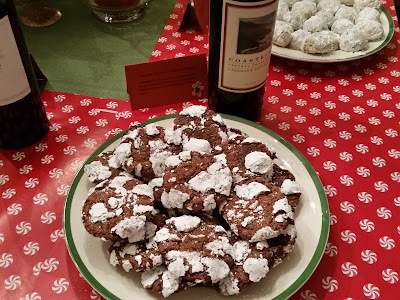 Patrick had an orchestra rehearsal on this particular night but I saved him a cookie from each pairing and there was plenty of wine leftover for him to have a personal cookie and wine pairing. Here's the savory spread - chips with spinach artichoke dip, antipasti platter - olives, assortment of goat cheese, salami and crackers, and grapes. And that's how you have a cookie and wine pairing party! Their in-house catering is remarkable. The food at chicago wedding venues was delicious. So many of our guests (including and especially the foodies) have told us it was the best food they'd ever had at a wedding. The service too was impeccable but not overly formal.